No field curvature, off-axis coma, or astigmatism. Carbon fibre truss-tube for low thermal expansion, rigidity and weight saving. PlaneWave's CDK17 is a 17 inch (0.43 m) aperture f/6.8 telescope that is very well suited for astro-imaging as well as for visual use. The CDK17 telescope utilises the Corrected Dall-Kirkham (CDK) optical design, developed by Dave Rowe, that provides excellent imaging possibilities with large format CCD cameras, while remaining superb for visual use. The CDK design far exceeds the off-axis performance of most commercial telescope designs including the Ritchey-Chrétien design making the CDK an innovative solution for unsurpassed astro-imaging quality at an affordable price. The end result, at the image plane of the CDK17, will give you pinpoint stars from the center to the corner of its 70mm field of view without any field curvature, off-axis coma, or astigmatism. 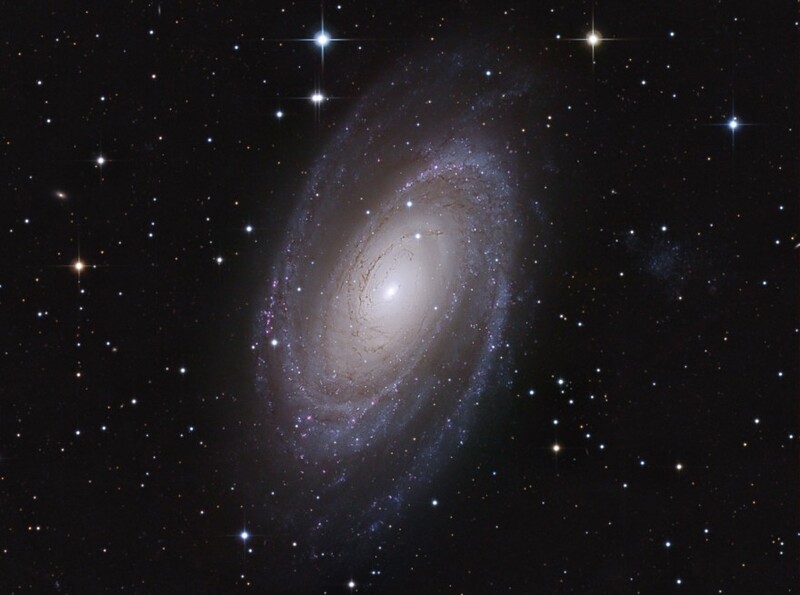 The no-compromise optical design is unique in making the optical alignment forgiving and collimation very easy which guarantees the user the best possible performance from the telescope. The CDK17 features a dual carbon-fibre truss design, with 3 cooling fans ejecting air from the back of the telescope, and 4 fans blowing across the boundary layer of the mirror's surface. The instrument weighs 43kg (94 lbs) and comes as standard with a back plate retaining ring ready to accept the focuser of your choice. The CDK17 telescope is an open truss tube design for a rigid, but lightweight structure, and for quick thermal cooling. The truss tube utilises a carbon fibre frame which minimises thermal expansion that can cause focus shift with changes in temperature. The carbon fibre truss tube design also promotes quick thermal cooling. To create the telescope's baffles, Planewave uses digital 3D printing technology. Their 3D printers add successive layers of material to construct a baffle system with precision. These internal stray light baffles minimise vignetting and maximise image contrast. To mount the CDK17 onto a mount, PlaneWave supplies the CDK with a dovetail bar. The CDK features a dovetail expansion joint that allows for the difference in thermal expansion between carbon fibre and aluminium. This expansion joint allows the aluminium dovetail expand and contract without stressing the carbon fibre lower truss. For dew prevention, the CDK17 is internally wired with polyimide film heater pads and temperature sensor, ready to be controlled with the optional Delta-T controller. To help the primary mirror to cool, three cooling fans eject air from the back of the telescope and four fans blowing across the boundary layer of the mirror surface. This helps the telescope to reach thermal equilibrium quickly. The fans can be controlled by a computer if the optional Electronic Focus Accessory (EFA Kit) is purchased. The Ritchey Chrétien (RC) optical design has long been "the standard" in high end imaging telescopes due to its use in many professional observatories. The RC is successful in eliminating many of the problems that plague many other optical designs, namely off-axis coma, however the RC design does nothing to eliminate the damaging effects of off-axis astigmatism and field curvature. The RC design is also very difficult, and therefore expensive, to manufacture and optically align. The CDK design tackles the "off-axis coma problem" by integrating a pair of correcting lenses into a two mirror design. The beauty is that this design also corrects for astigmatism and field curvature. Because the lenses are relatively close to the focal plane (unlike the Schmidt corrector plate found in various Schmidt Cassegrain designs), and because these lenses work together as a doublet, there is no chromatic aberration. The CDK offers a wide aberration-free, flat field of view that allows the user to take full advantage of the very large imaging chip cameras in the market place today. In the image above, are two simulations showing the CDK’s stunning optical performance.The left column is a diffraction simulation and the second in the right column is a spot diagram. In both simulations the small squares are 9×9 microns, about the size of a typical CCD pixel. In the diffraction simulation the star images on axis and off-axis are nearly identical. In the spot diagram 21mm off-axis the spot size is an incredible 6 microns RMS diameter. For 26mm off-axis, a 52mm image circle, the RMS spot size is 11 microns. This means stars across a 52 mm image circle are going to be pinpoints as small as the atmospheric seeing will allow. Both of the simulations take into consideration a flat field, which is a more accurate representation of how the optics would perform on a flat CCD camera chip. 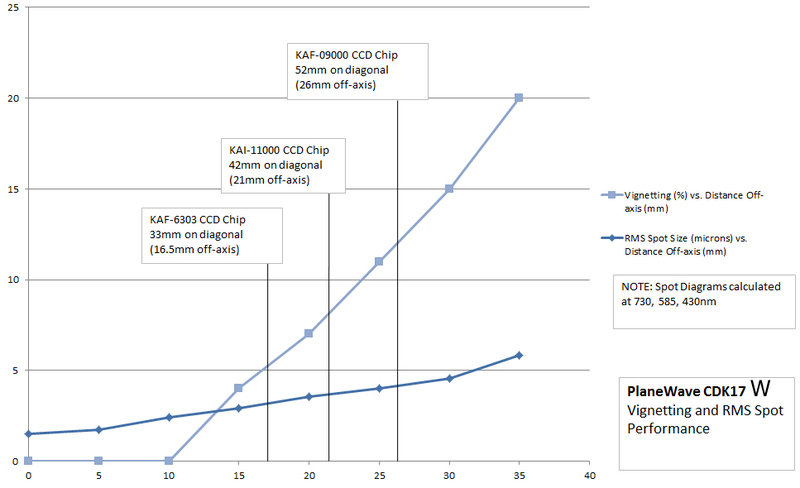 The diagram above shows the vignetting and spot diagrams for the CDK 17W for CCD cameras that use the large CCD sensors KAF 6303, KAF 11000 and KAF 09000 for the three wavelengths 730, 585 and 430nm. The diameter of a star at the edge of the flat field corresponds to the pixel size of current large-format CCD chips and the imaging quality of the optics is limited only by the seeing conditions and the quality of the tracking. The large field of view of 70mm diameter offers enough tolerance for CCD cameras with ever increasing sized CCD sensors. Having an aberration free telescope design means nothing if the optics cannot be aligned properly. Many Ritchey owners never get to take full advantage of their instrument’s performance because the Ritchey is very difficult to collimate. Aligning the hyperbolic secondary mirror’s optical axis to the optical axis of the primary mirror is critical in the Ritchey design, and the tolerances are unforgiving. The secondary mirror of the CDK design is spherical. It has no optical axis and so the centering tolerance of the CDK secondary mirror is comparatively huge. With the help of some very simple tools, the CDK user will be able to set the secondary spacing, collimate the optics and begin enjoying the full performance potential the instrument has to offer within a few minutes. 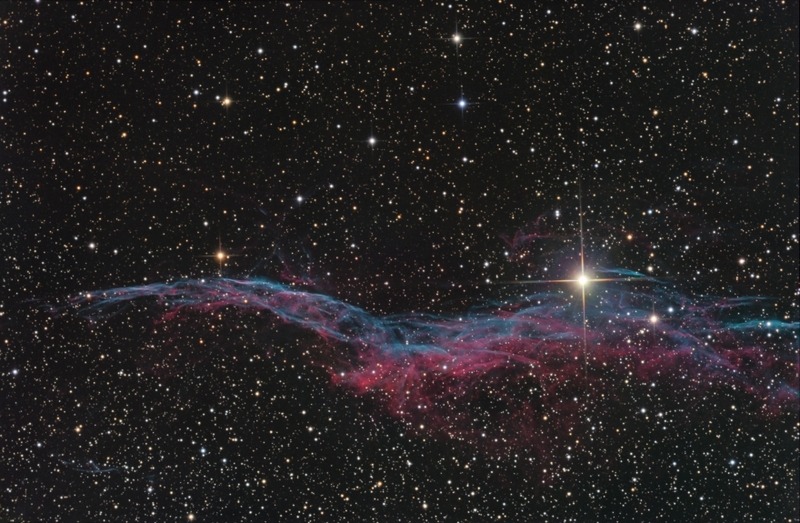 Below are a few images (M81 top; Veil nebula bottom) taken with a CDK17 to show how well they perform. Cooling Fans Three cooling fans ejecting air from the back of the telescope and four fans blowing across the boundary layer of the mirror surface. This helps the telescope to reach thermal equilibrium quickly. The fans are controlled by a computer if the optional Electronic Focus Accessory (EFA Kit) is purchased.